Skallerup Klit is part of the bay of Jammerbugten in North Jutland. In Skallerup Klit there are cottages and child-friendly beaches galore. 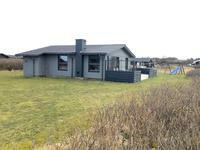 You may also go on exciting trips to Skagen and to Aalborg from a cottage in Skallerup Klit. The local area, though, is also rich, particularly on nature with its deep gorges in the dunes where an active holidaymaker can be challenged. Don't forget a visit to the large water park and holiday centre in the area. See the holiday homes in Skallerup Klit on a map - click on the map!